On Saturday, September 22 all are invited to the Hat Creek Burger Company in Westlake for a morning of food, fun, and a very special storytime. Texas author Cate Berry will read from her new picture book, Penguin and Tiny Shrimp Don’t Do Bedtime! 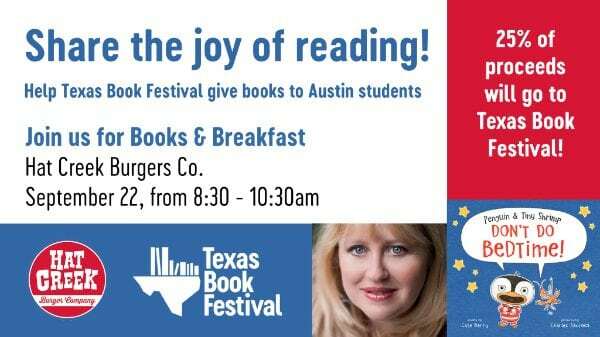 At this fundraiser geared towards families, Hat Creek will donate 25% of the breakfast proceeds to the Texas Book Festival — so order up from their delicious morning menu anytime between 8:30 – 10:30 a.m. Your kiddos will have two opportunities to hear Berry read her new picture book — storytime will begin at 9 a.m. and again at 10 a.m. Penguin and Tiny Shrimp Don’t Do Bedtime! features colorful and witty characters adventuring through fireworks and shark-infested waters, all the while determined not to go to bed. While you’re there, you’ll also have the chance to learn more about the Texas Book Festival’s Reading Rock Stars program that bring books to life for children in low-income schools by inviting authors and illustrators into classrooms. This program helps inspire students to read, write, and create. This event is free and open to all ages! You’re simply encouraged to RSVP on the Facebook event page to help gather an estimated head count. For more information about Hat Creek, please visit hatcreekburgers.com. For more about the Texas Book Festival, please visit www.texasbookfestival.org and follow along on Facebook, Twitter, and Instagram @texasbookfest. Hat Creek Has More Than Burgers…Try the Breakfast!